Known for bringing art to the table and turning what is on the table into distinct works of art, Bettina Werner, is once again blurring the fine distinction between art and life. Focused around her Salt Sculpture-Table ("A visually seductive work" The New York Times, 10/1996), members from all sectors of Manhattan's society participated in a "Salt" backgammon tournaments, playing on and competing for works of art. Ms. Werner rewarded the winner of each tournament with her own signature backgammon set designed and created with salt crystals, the artist's famed medium. The unique Salt Crystal Backgammon-Sculpture board is worth $5,000. 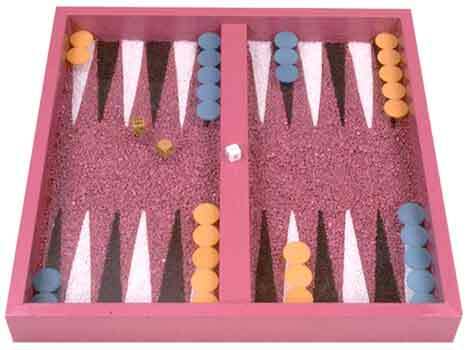 Ms. Werner created her first Salt Backgammon-Sculpture in 1994, utilizing various grades of salt crystals. The piece quickly became a favorite among collectors and avid players of the game. Ms. Werner's latest salt boards were created not to be sold but with the pure intention of the game - the only way to obtain it is to win it! the Queen of Salt by Irene Silverman. CLICK HERE to find out more about The First Hamptons Salt-of-the-Earth Backgammon Tournament, September 2002.